Product prices and availability are accurate as of 2019-04-12 02:45:13 EDT and are subject to change. Any price and availability information displayed on http://www.amazon.com/ at the time of purchase will apply to the purchase of this product. 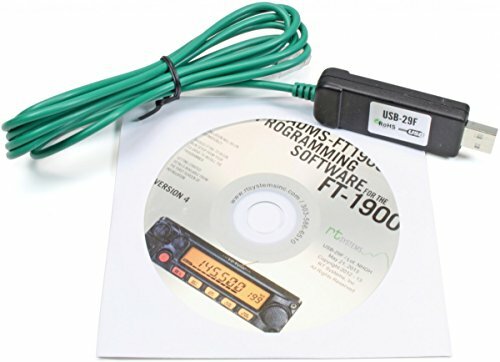 RT Systems Software Version 4.50 on CD comes with USB-29F RT Systems Computer Interface Cable USB to 6-Pin Modular Plug System Requirements: Microsoft Windows XP (SP3), Vista, Windows 7 (32 or 64 Bit) or Windows 8 (full version) Spreadsheet layout with many point and click options. "Read" the current configuration from the radio for editing or start from scratch in a new file. The programmer has copy and paste of memory channel information between files. Column editing for changing several channels with minimal typing. An easy interface to ARRL Travel Plus, RFinder-Worldwide Repeater Directory, Radio Reference, or Repeater Book to get repeater information. (separate purchase or subscription may be required) Ability to copy and paste spreadsheet or website data.